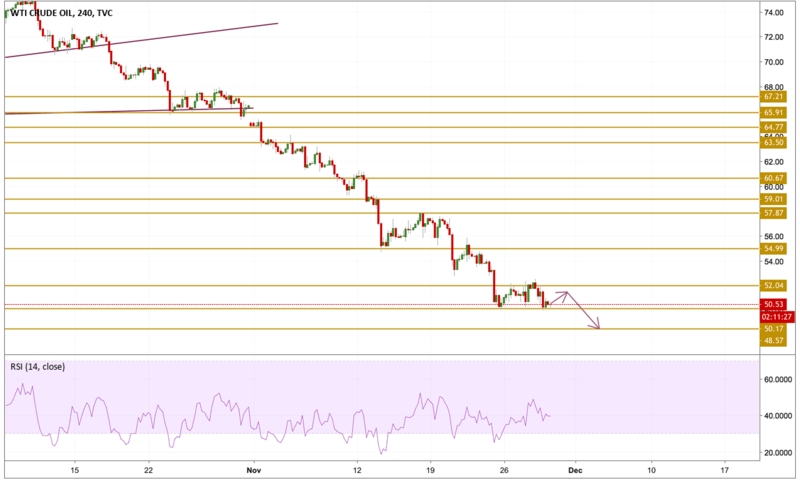 Oil started the session coming off Wednesday's lows at the critical $50 handle, but it's hard for the bulls to take control of the market after Saudi Arabia stated that it's not willing to reduce supply unless the rest of the OPEC members act accordingly. Furthermore, the EIA reported another weekly buildup in US crude oil stockpiles, this time by 3.577m barrels to keep the pressure on the prices. Crude oil prices are still trading within the same range and seem to be consolidating their losses. The price tried to break below the $50 level but failed. However, the price is still hovering just above it despite the buildup in the momentum which seems that it is going to turn bearish again. Today we will be watching the $48.57 support level if the $50 critical handle gets penetrated.